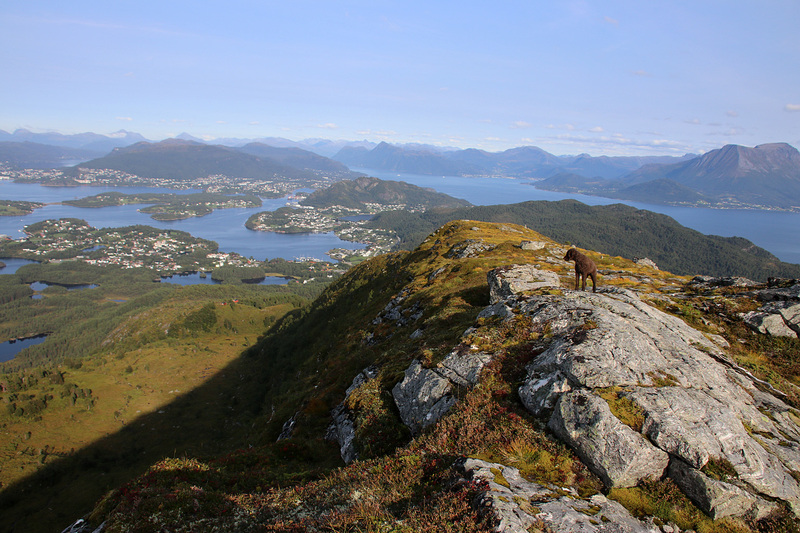 Monday: After working from Anne’s place in Sogndal, I drove back home to Sunnmøre in the afternoon. 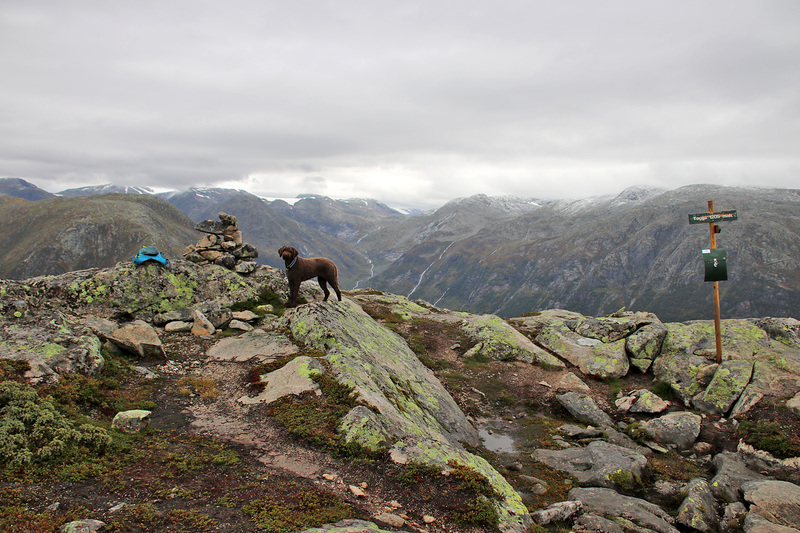 I stopped in Sogndalsdalen to walk the dog on Togga. Ok – it was dual purpose. I needed to walk myself too. I decided to walk as fast as I could without jogging. This is a “killer hill“, so incredible kudos to the ones that can jog up here. Like the guy I met on our way down. It took us 43 minutes to reach the top (2,5km, 775 vertical meters). I reckon 35 minutes would be an honest result if I ever decide to be serious about this hillside. I can dream, can’t I? The weather wasn’t too nice up there, so I just wanted to get off the mountain and get on with my journey back home. 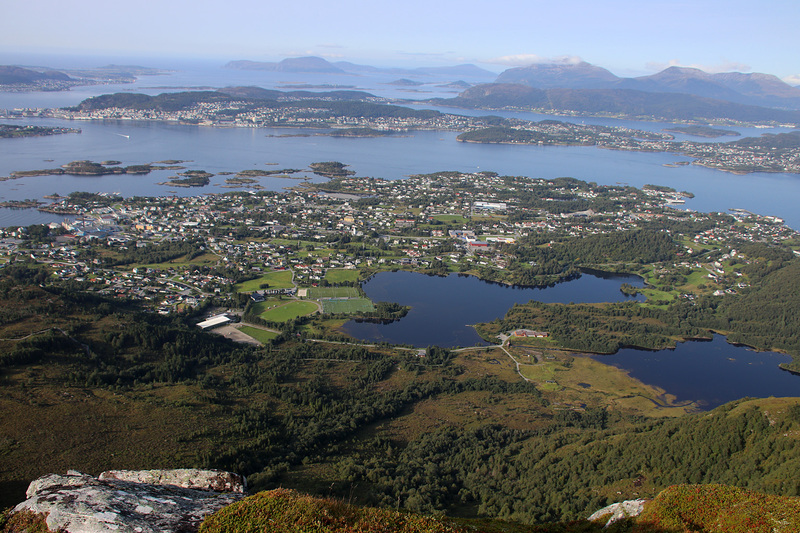 Tuesday: Ålesund day. After work, I drove to the island Sula to visit Svanshornet. It was a nice temperature outside, so I decided to put on a shorts and do a mixed jog and walk. 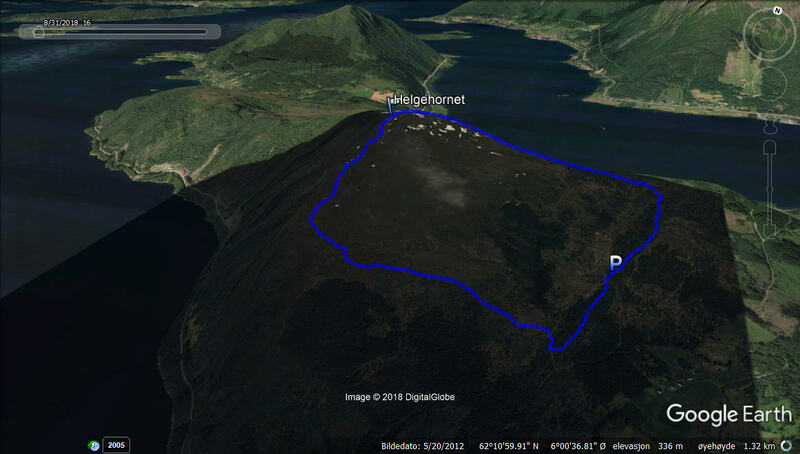 I chose a trailhead (by lake Raudåvatnet) where I’d never been before, and got a chance to get warm on the flats by the lake, before going up the forest ridge towards the Fiskarstrandhyttane cabins. The forest path is well worn and easy to jog. 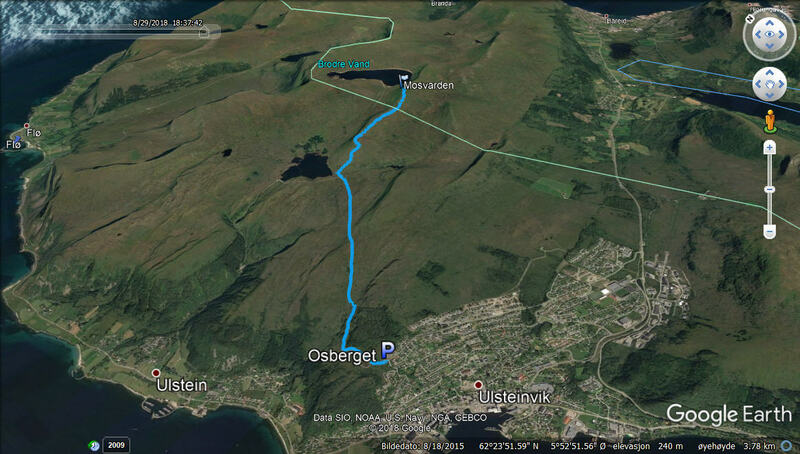 From Fiskarstrandhyttane, the path runs across boggy ground, draining the energy out of most runners. Reaching lake Purkjetjønna was a delight, as then there would only be 0,5km to go. 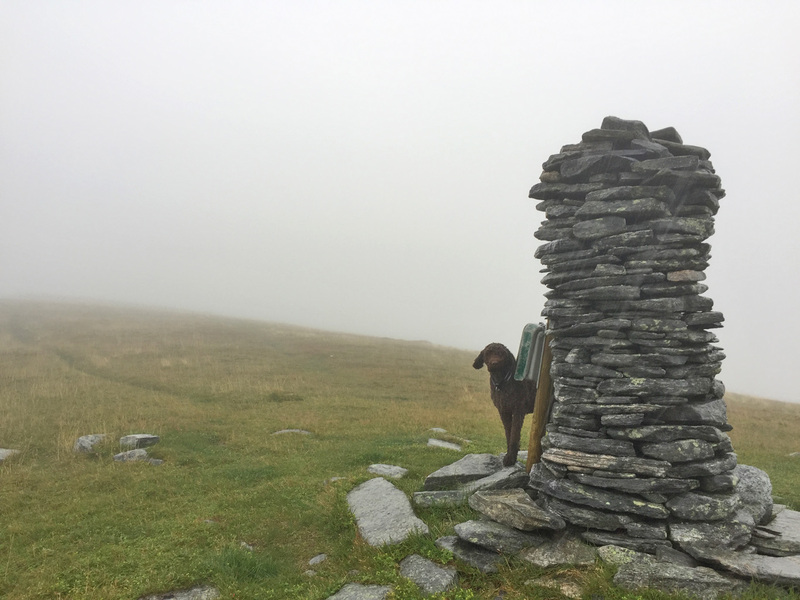 Karma and I reached the top in 40m:54s, after 4km and 530 vertical meters. Now it was time to enjoy the views and a short rest. On the way down, we took a different route down to Fiskarstrandhyttene, hoping I would discover another path that would give me a nice round trip. But I didn’t. It’s OK, though. The normal route to Svanshornet is quite nice. 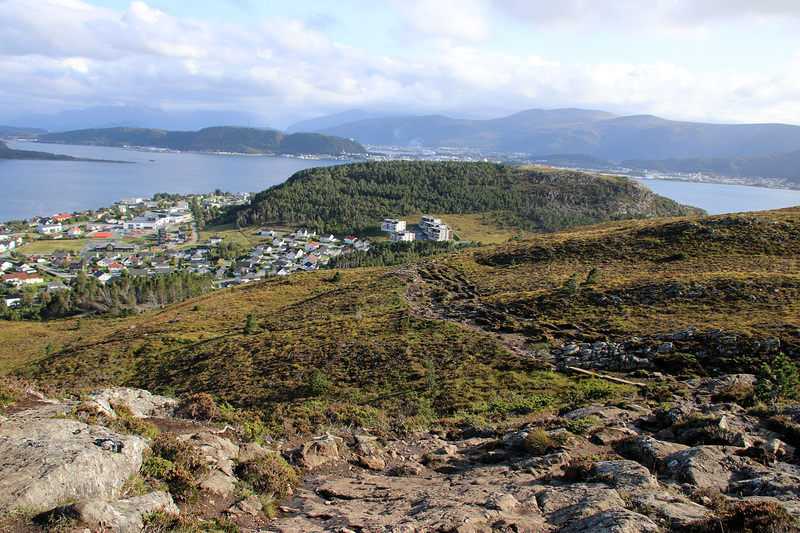 Anyway, today I drove up to Bugardsmyrane above Ulsteinvik, warmed up slightly (I really hate that part) and then got ready for a 5km run up to Mosvarden. The “Morderbakken” hill (“Killer hill”) really lives up to its name, but I was able to prevent falling into walking mode. 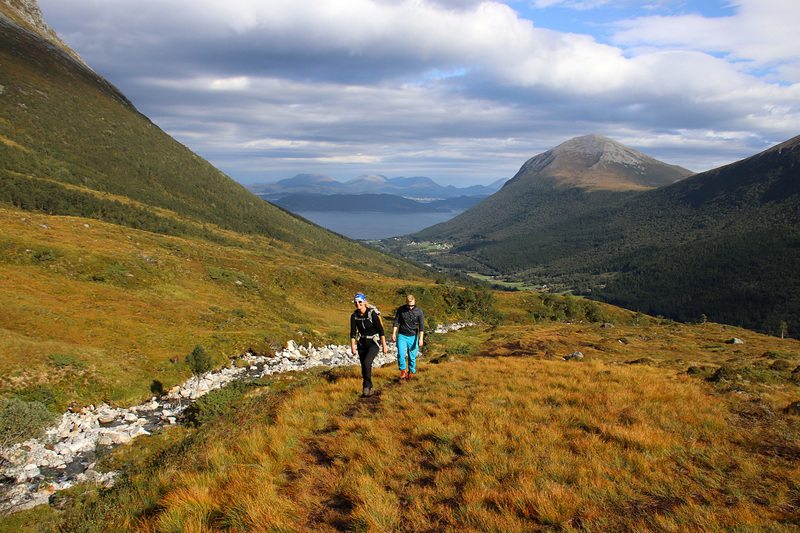 The reward is 1km of relatively flat terrain before you take on Mosvarden itself. 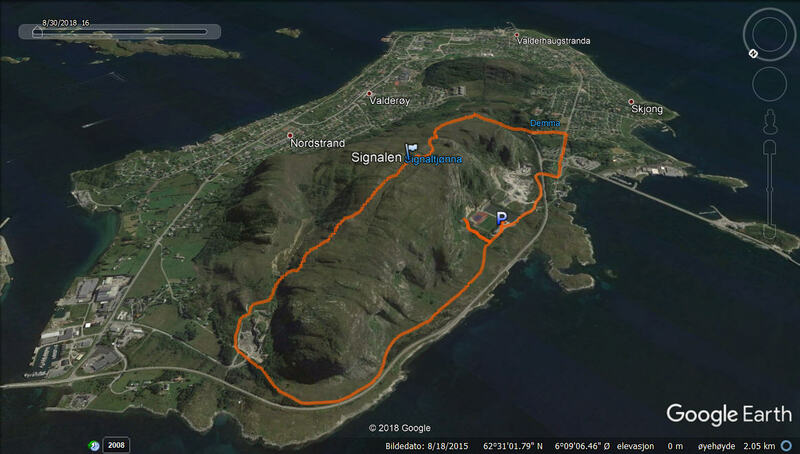 Thursday: Another day in Ålesund, and as I realized that it’s been *years* since I last visited Signalen on Valderøya. Today was a perfect day to do something about that. I parked at Valdervoll, but due to construction work, I couldn’t figure out how to get to the couloir I had planned to ascend. So then I headed northbound along the normal path between the road and the mountain. 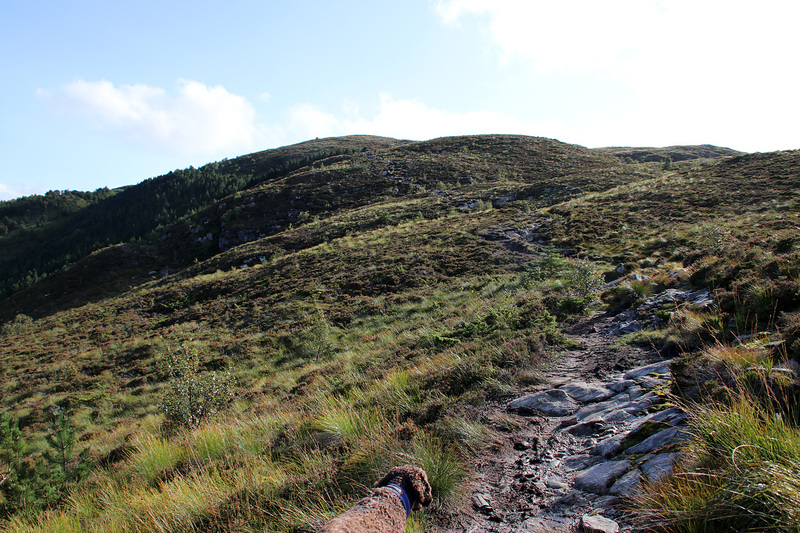 Within a minute, I discovered a path going up towards the steep cliffs. Was there a path I didn’t know about? Interesting! But it turned out to be a dead end, as it led me to a cave which I had no intention of climbing into. 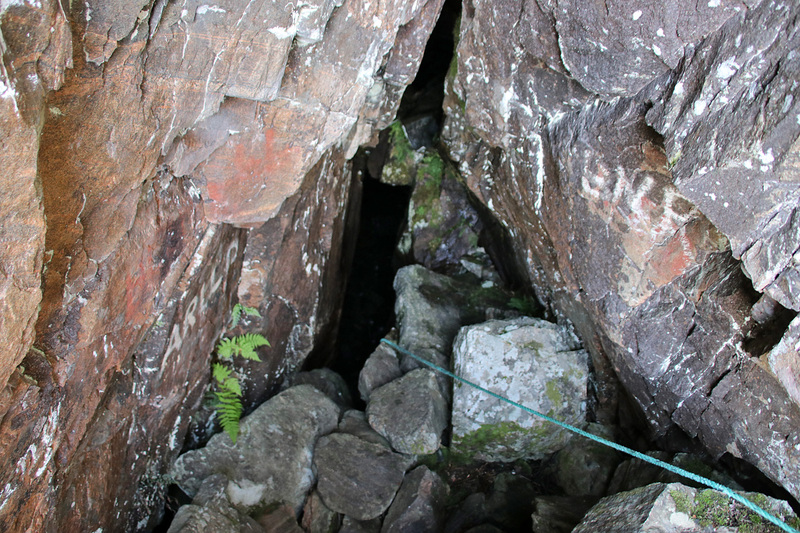 I returned to the main path and passed Skjonghelleren – the famous cave – that I’ve been to many times before. It was part of my plan today. 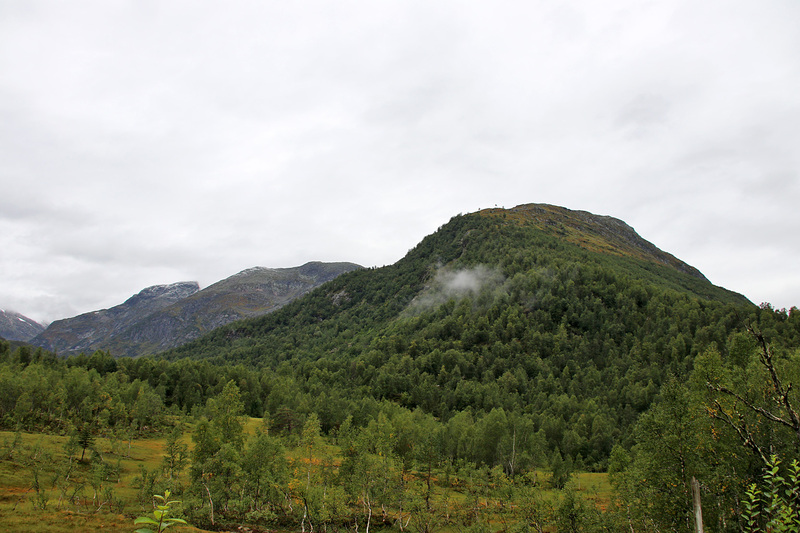 The main path took me to the north side and into Sætredalen valley. I thought I had been here before, but couldn’t say for sure. In any case, it was not particularly interesting terrain. From the top, we followed the main path southbound until I found another path that took us down to the starting point. Altogether a nice round trip hike! 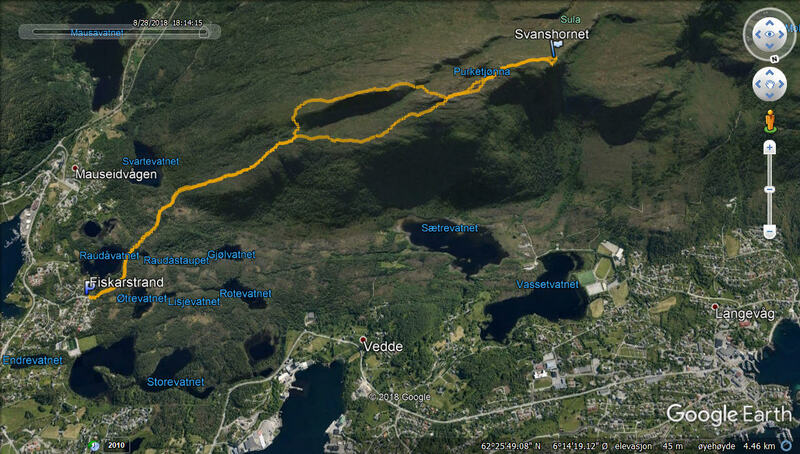 Friday: Anne came up from Sogndal, and we agreed to meet by Helgehorntunnelen and hike Helgehornet. We drove up to the shooting range and headed out from there. 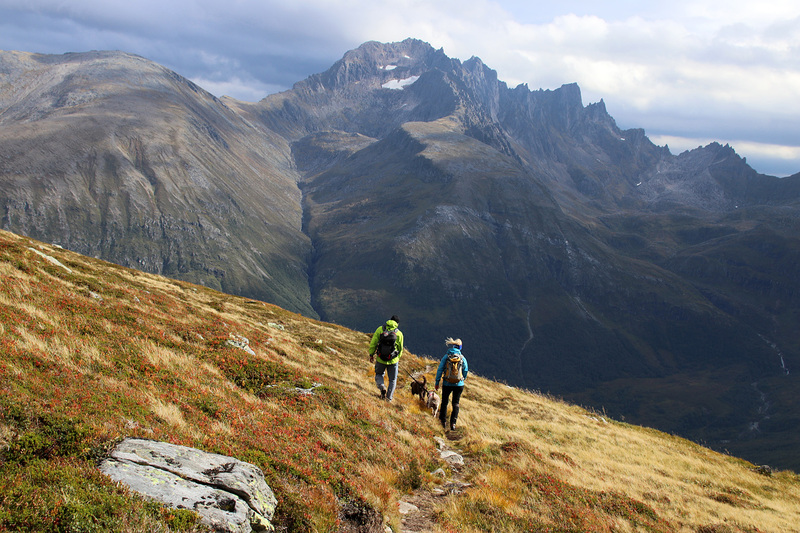 We took the path leading up to Helgehornet’s east ridge – which seems to be the de facto route for ascent. Fortunately, there were no shooters at the time. It’s not that Karma gets scared, but I can see that she is a bit … uneasy about it. In any case, Helgehornet offers pretty nice views. I’m not going to take that away from the mountain. Saturday: What a way to start September! 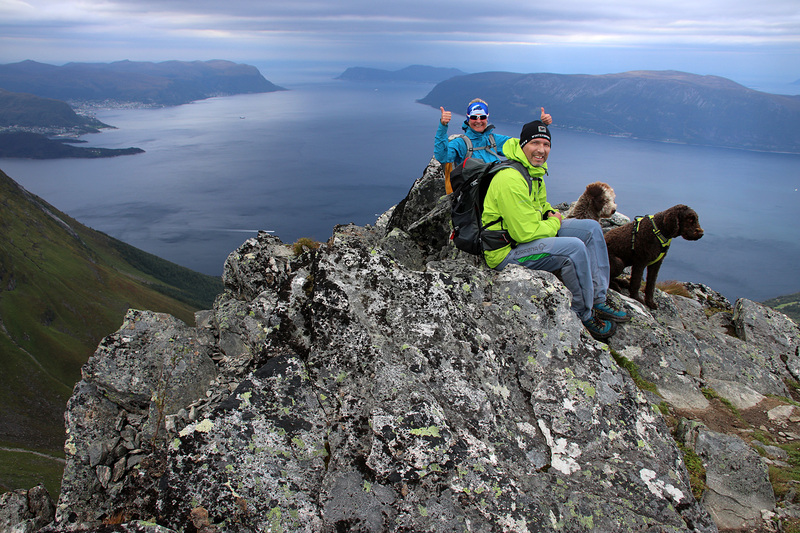 Today I climbed Klovtinden with friends – the hardest peak in Ørsta and possibly in Sunnmørsalpene altogether. Many thanks to Anne who looked after Karma. If you want to read the trip report, you’ll find it here. Sunday: It was actually a coincidence that I climbed Klovtinden on Saturday and ended up on Klovetinden on Sunday. They’re two quite different mountains. While the first is a monster, the latter is quite a gentle top. 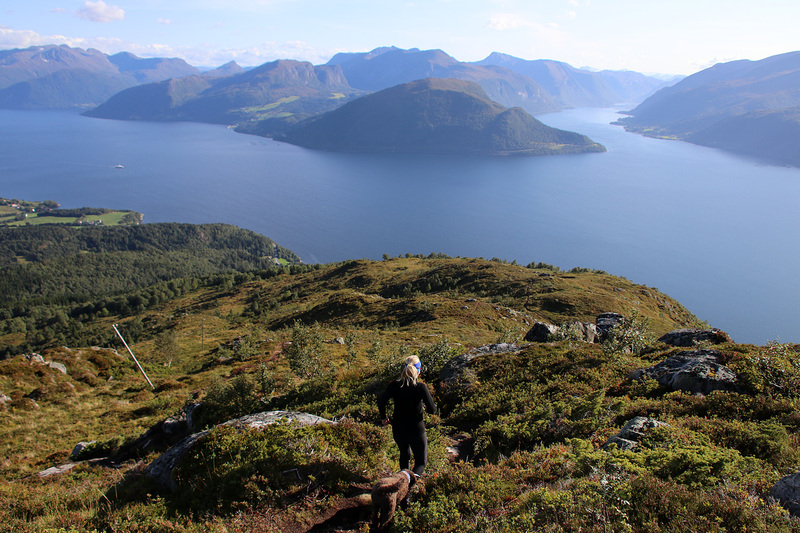 Anne and I joined our friend Terje and his son Sondre for this hike. 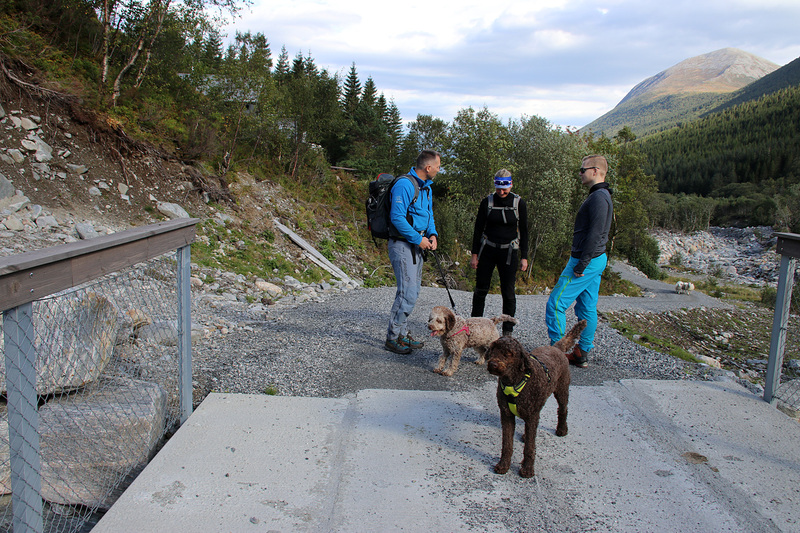 We met them at the Barstadsætra trailhead in Erdalen. 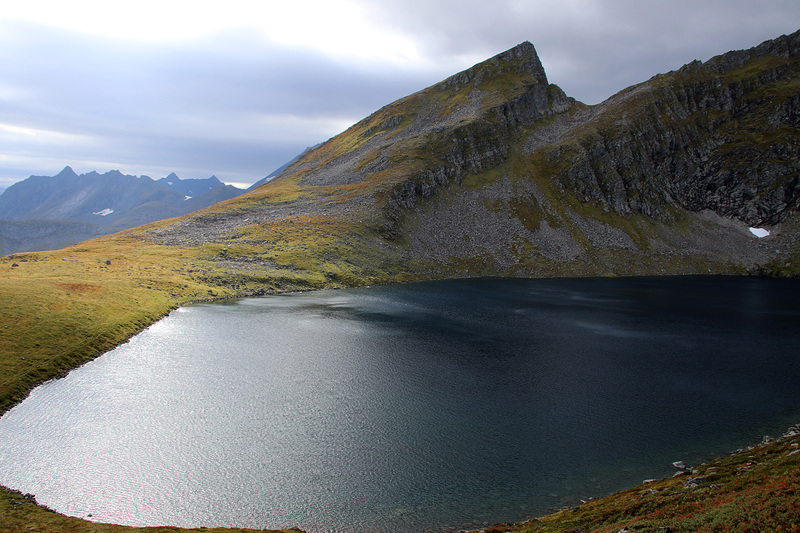 I had been to Klovetinden once before – in 2006, and I thought I remembered the hike until I checked my trip report. I would never in a million years have remembered that I *skied* this mountain. No skiing today, though. 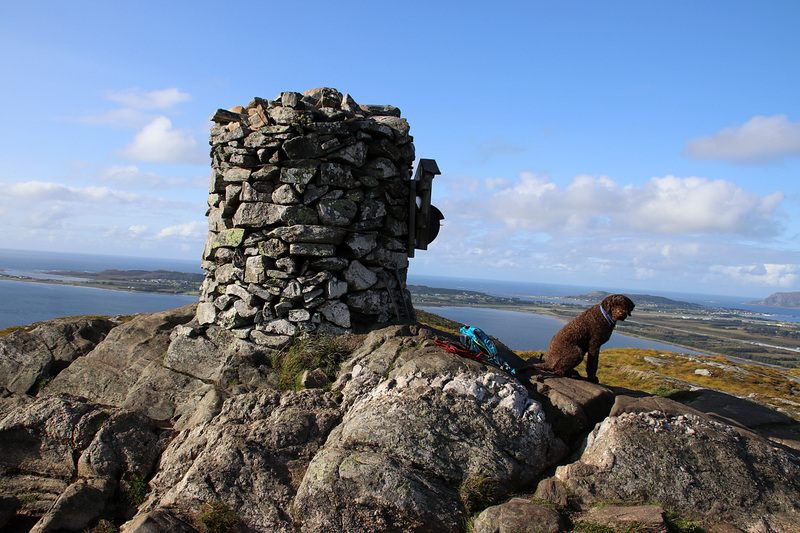 It was a really nice autumn day, albeit windy higher up. 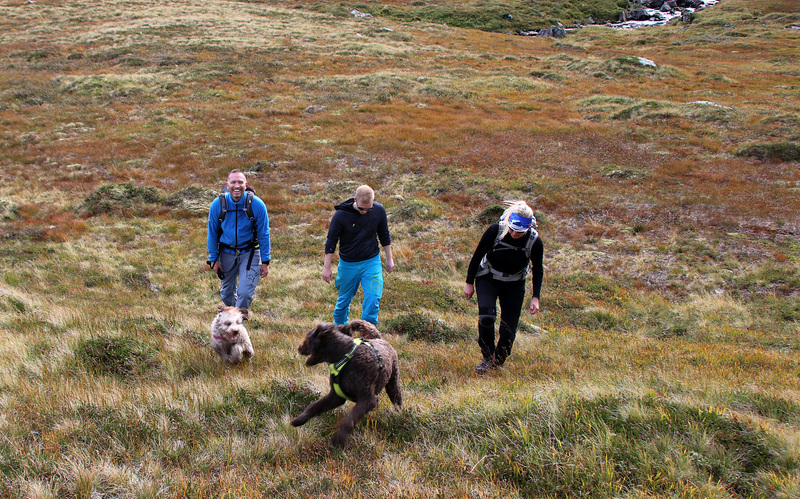 We followed the path along Barstadelva and then got on the path towards Klovetinden before reaching lake Storevatnet. 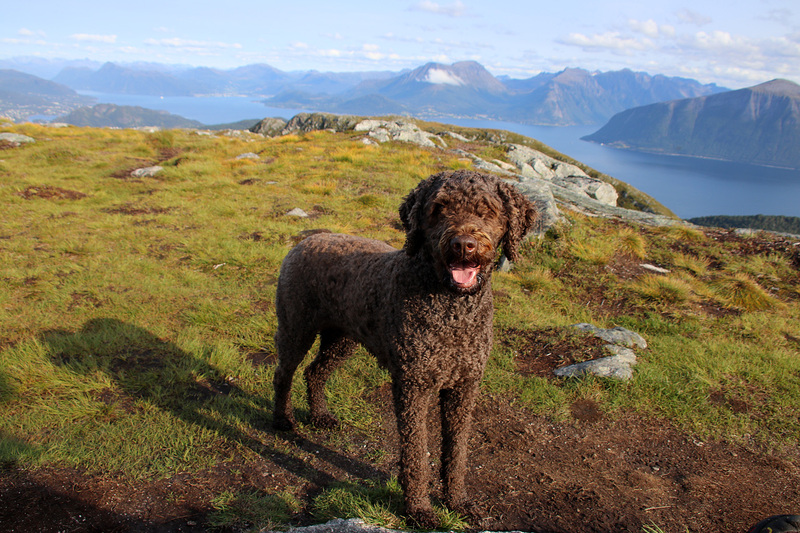 Terje’s family has got a new member – Jade. Karma had met her when she was a really small puppy, and we were curious as to how they would get along together. It went as expected. Fun in the beginning, then Karma turned into the grumpy grandma. But once Jade understood the “order of things”, it was all good. 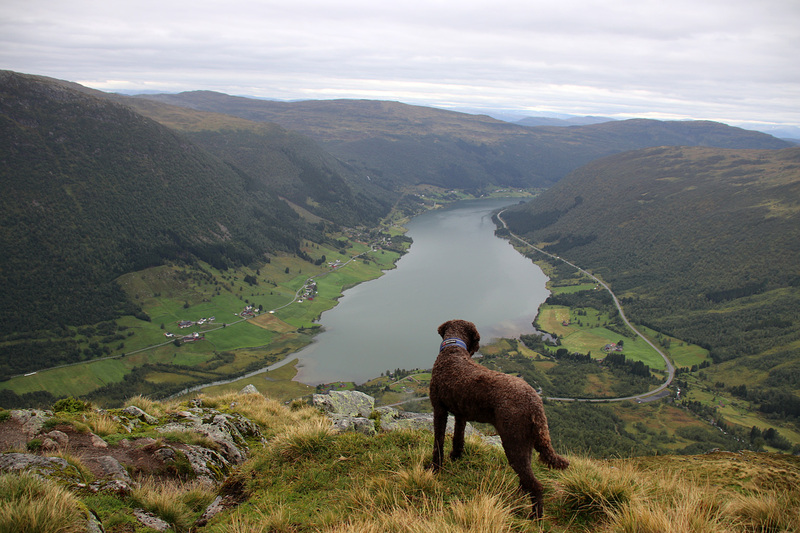 Sondre decided to wait for us by a small lake before reaching lake Klovvatnet. 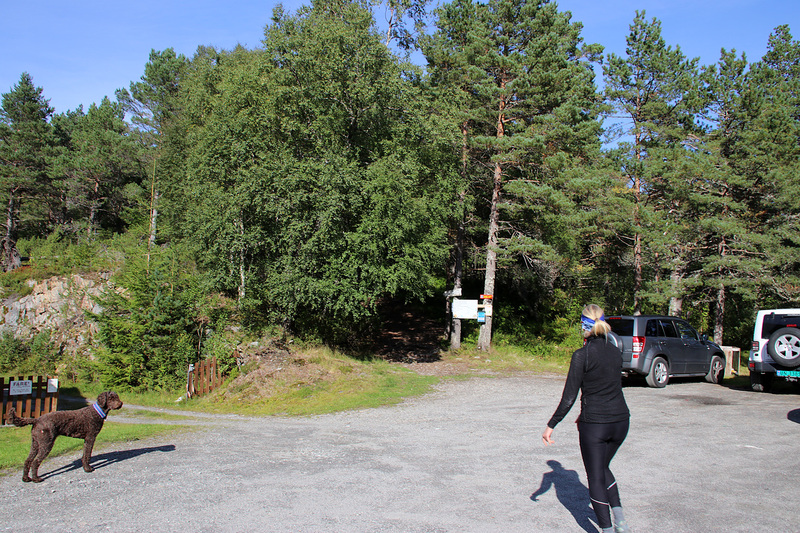 Terje and Anne decided to follow the normal path up to the plateau, while I wanted to hike straight up, off-trail. But then I noticed that there is actually a path going straight up. 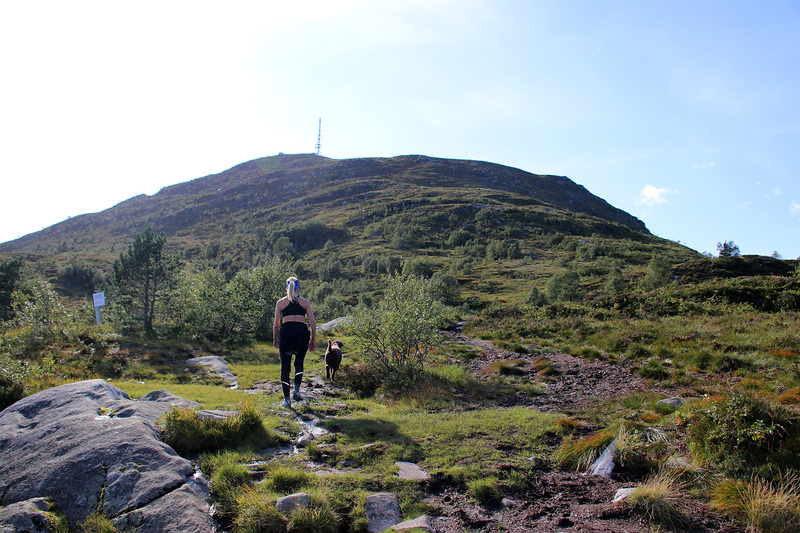 We took the same route down to the lakes, picked up Sondre and took a different path back to Barstadsætra. 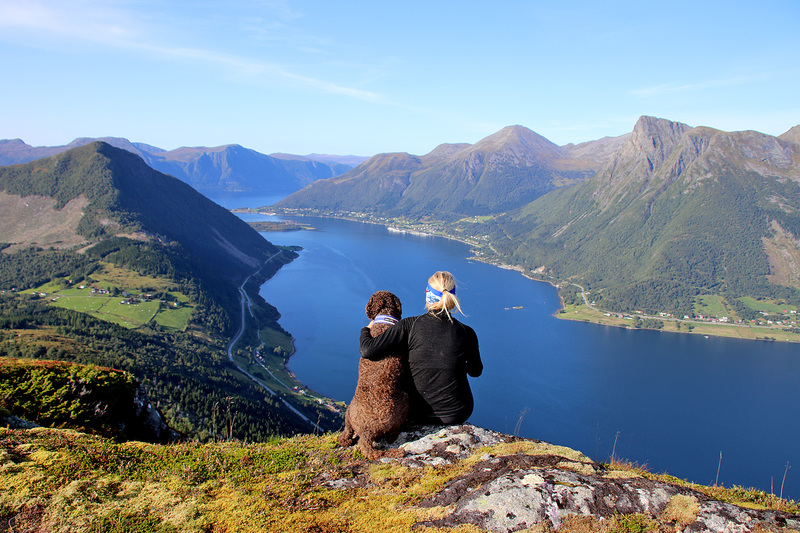 A beautiful day in the Sunnmøre alps! Heading down. 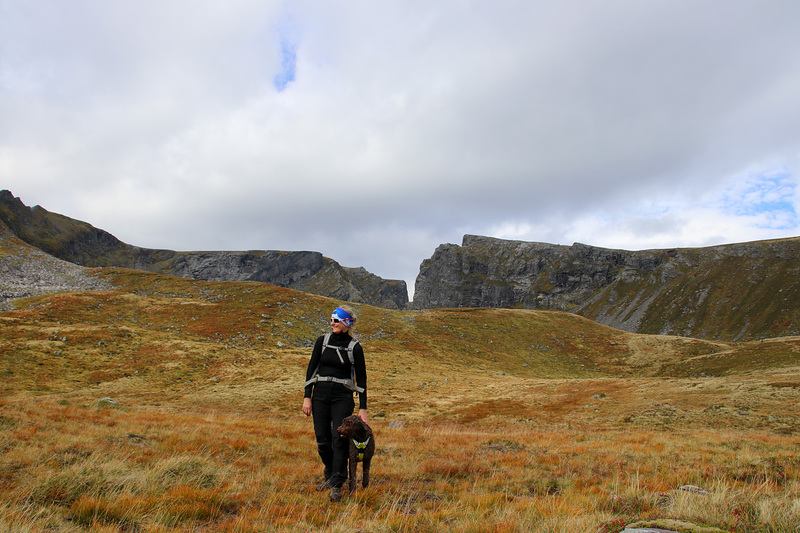 Molladalstindane in the background. What a stunning location! And really nice photos!